Music Hall was constructed in Over-the-Rhine in the late 1870s. Cincinnati had been founded only 90 years earlier, but already there had been several uses for the land on which the hall sits. 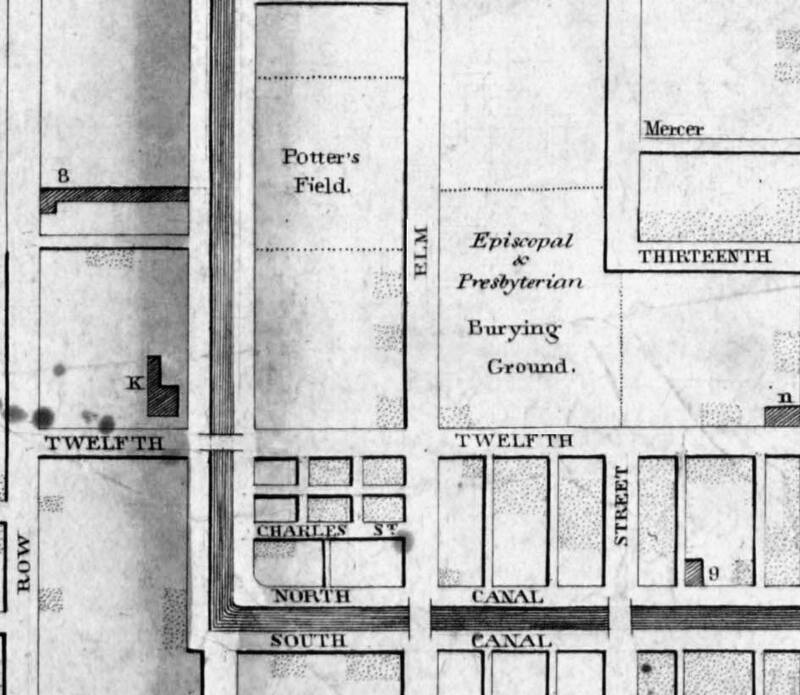 A map from 1830 points to a Potter's Field in that block. The Potter's Field was used for immigrants and paupers who had the misfortune of dying without identification, or without loved ones to claim their bodies. By 1842, the northern part of the tract held the Cincinnati Orphan Asylum. Some twenty years later, those same individuals sold the land to the city for temporary use while a new Commercial Hospital was built directly west of that site, across the canal. Once the new hospital was up and running, the North American Saengerbund Society decided the lot on Elm Street between 12th and 14th Streets was the perfect location for its 1870 convention in Cincinnati and a large wooden hall was built on the site for Saengerfest. Once the singing had ended, the hall was used for expositions, and thereafter was referred to as "Exposition Hall." Construction on Music Hall started in October, 1876, right after the Exposition Hall was torn down. It was during the excavation of the site for the new building's foundation that workers came across the first ''human remains''. Newspaper accounts at the time -- which sometimes were embellished to sell papers -- indicates that the discovery drew crowds who watched as boxes were filled with skeletal remains. Music Hall Association meeting minutes show that the city was not interested in helping dispose of the skeletons. W.H. Harrison was on the Association's board, as well as on the board of Spring Grove cemetery. He arranged for a plot to be used for a proper reburial of all the skeletons that were found. According to news reports, workers stopped digging the trench when a snowstorm interfered with their work. While they were gone, souvenir hunters removed several bones, including a skull and two pelvic bones, possibly those of a young girl. Rather than move the three bodies to Spring Grove Cemetery with the skeletons found in the 1870s, they were ''given a fitting burial in the pit of the new elevator shaft,'' a four-foot cement vault. Later that same year, as another trench was being dug -- this one under the south wing -- workmen discovered what was called a ''Valley of Death'' -- 65 graves. Again, even though watchmen were placed nearby, several skulls were stolen during the night. Initial investigation indicated that there were traces of coffins around the bones, but all the wood had disappeared in the century between burial and discovery. Newspaper reports indicate that all were reburied where they were discovered. Fast forward to early May, 1988. The history of the site and the events of 1927 were long forgotten. Workers drilling a new elevator shaft uncovered 207 pounds of bones that had been interred in concrete; the coroner was called in to investigate the possibility of foul play. Later a number of the bones ended up at the physical-anthropology lab at the University of Cincinnati, where they were studied in order to provide more information on the physicality of people from the early 1800s. Forensic anthropologist and Mt. St. Joseph professor Dr. Elizabeth Murray examined the bones as part of her doctoral dissertation to see what secrets they held about life among Cincinnati's first settlers, and to compare them with bones from other Americans living in the 18th, 19th and 20th centuries. In the mid 1990s, Dr. Murray took students from the Mount on a field trip to Music Hall, to excavate under the Music Hall stage in hopes of finding additional bones as well as artifacts that could shed more light on early life in Cincinnati.